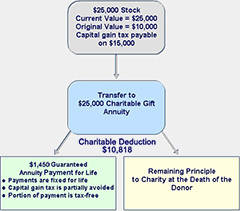 Charitable gift annuities are life income gifts that offer unique benefits to individuals concerned about future income. By utilizing appreciated stock to fund the annuity, donors can make a larger gift than they thought possible, receive a larger income stream for life, and avoid capital gains taxes. By doing so, the capital gain on the stock is avoided upon funding of the annuity. However, a portion of the capital gain will be applied to future annuity payments. For example: Charlie, age 72, owns stock purchased twelve years ago for $10,000, with a current fair market value of $25,000. He transfers that stock in exchange for a 5.8% gift annuity. His charitable deduction is $10,818, or 43.0% of the annuity amount. A portion (43.0%) of the $15,000 capital gain is avoided, while the balance ($8,550) is recognized over his lifetime through the annuity payments. Specifically, Charlie receives a guaranteed fixed payment of $1,450 per year for the remainder of his lifetime. Of this annual annuity amount, he will report $443.70 as ordinary income and $603.50 as capital gain; $402.80 would be tax-free* In this manner, the $8,550 of capital gain is eventually fully recognized over the course of his 17.8 years of life expectancy. * This allocation applies only through his life expectancy. 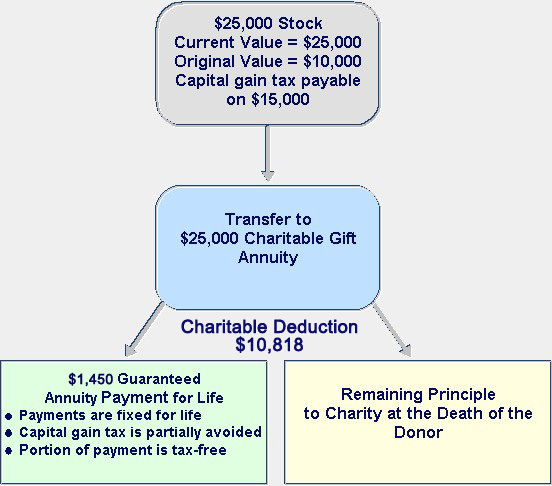 For an illustration and assistance in creating a gift annuity, (click here). Considerably higher rates can be obtained through deferred gift annuities. These annuities are popular with individuals who are in their high wage-earning years and concerned with providing for their retirement. 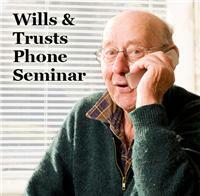 For more information on creating a deferred annuity, (click here).